TOP IMAGE: The citizens of Prague throwing up makeshift barricades countering the Soviet tanks. "When forces that are hostile to socialism try to turn the development of some socialist country towards capitalism, it becomes not only a problem of the country concerned, but a common problem"
The crackdown of the Hungarian uprising in 1956 had for some time crushed all hopes of reforming Communist regimes. But by the mid-1960s the reformist spirit was sparked again, this time in Czechoslovakia. The new party leader Alexander Dubcek unleashed economic (less state control, more market) and political (more open debate in the party and in the media) reforms. These reforms moving towards “socialism with a human face” produced the “Prague Spring.” The Kremlin and the Warsaw Pact allies feared a spill-over of these reforms into their countries. They put a lot of pressure on the Dubcek regime to take back the reforms. When he failed to do so, an invasion force from five Warsaw Pact countries invaded Czechoslovakia on August 21, 1968. This massive military force stopped the reforms and re-imposed orthodox Communist Party control. The United States and NATO took no action in response to the Warsaw Pact intervention. The invasion was retroactively justified by the “Brezhnev Doctrine” (named after the Politburo chief Leonid Brezhnev), which proclaimed a de facto limited sovereignty of the Kremlin’s satellite regimes. In the morning hours of August 21, 1968, Soviet and Warsaw Pact tanks roll in the streets of Prague; to distinguish them from Czechoslovak tanks, they are marked with white crosses. 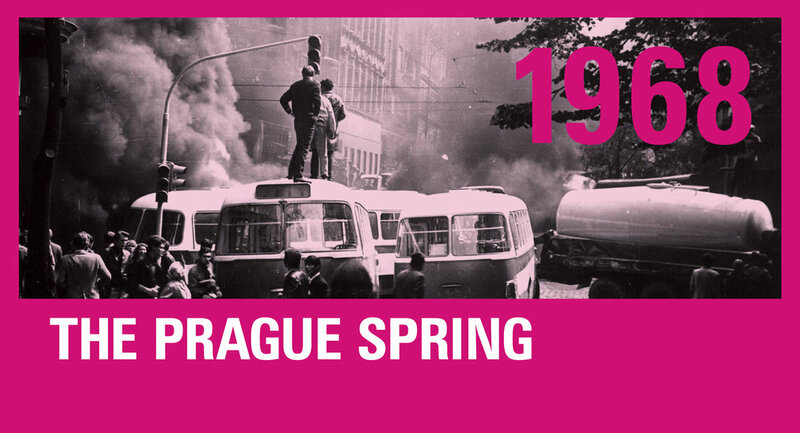 In the center of Prague on St. Wencelav Square, thousands of civilian protesters demonstrate their agony over the Warsaw pact invasion of their country to stamp out the reforms of the Prague Spring. Recruits from Austrian Army deployed a few miles at a safe and non-provocative distance from Czechoslovak border in late August 1968; after the deployment on the Hungarian border, this is the second time in a Cold War crisis the Austrian Army was guarding the border. Czech and Slovak refugees in Austria waiting in a food line; with the help of the International Red Cross and the United Nations High Commission for Refugees, Austria fed some 208,000 Czech and Slovak refugees; many returned to Czechoslovakia, some 2,000 emigrated to the United States, and as many as 3,000 found a new home in Austria.